The Must-Know Facts for a Trouble-Free Holiday ! This section covers the basics for driving in Italy. What documents are required to drive in Italy ? What is the minimum age for driving ? Do I need to wear a seat belt ? What are the speed limits in Italy ? What is the alcohol limit in Italy ? Is there compulsory car equipment ? How are fines issued in Italy ? What fuel is available in Italy ? When do I need to have the lights on ? For driving in Italy you need to carry with you a valid form of identification i.e. your passport as well as a valid full driving licence. If you are coming from the US or Canada, we recommend that in addition to your American or Canadian driver’s license you also carry an International Driving Permit (IDP) as you may be required to show the permit to pick up your car. The IDP provides a translation of your license and you can obtain one at your local American Automobile Association or Canadian Automobile Association office ($15 plus the cost of two passport-type photos). In addition, you are likely to be fined if stopped and found without a permit. Note that you must carry your American or Canadian driver's license as well as your international permit. International Driving Permit (IDP) is generally not required if you have a relatively recent EU driving licence. However, if you have an old driving licence ( especially one without a photo on it) , we recommend that you either get it updated or take an International Driving Permit as well. If you are driving in Italy in your own car, make sure you also carry with you the original vehicle registration document. If the car is borrowed, this document is required along with a letter of authority from the vehicle’s owner. Also make sure that you have clearly displayed sticker that shows your country of origin. For example, if you are driving a UK registered car, make sure you have a clearly displayed GB sticker. And lastly, make sure you have an appropriate motor insurance - third-party insurance is compulsory. Check with your insurance company before travelling that it is valid in Italy. Help others have a great time driving in Liguria and Italy. The legal minimum age to drive a car or motorbike over 125cc in Italy is 18 years. While the legal minimum age to drive a motorbike of 50cc to 125 cc is 16 years. And lastly, if you are hiring a scooter, the legal minimum age to drive a moped up to 50 cc is 14 years. One word of caution, car hire companies may employ slightly different age restrictions, which can vary across companies. We will strongly recommend that you check your car hire quotation for exact restrictions, as there may be an extra fee for drivers below the minimum age or over the maximum age. Do I need to wear a seatbelt ? Wearing a seat belt in the front is obligatory in Italy and also must be worn if fitted in the back. Children up to the age of 12 cannot travel in the front or the rear unless using a child seat adapted to their size and weight or an adaptor for a seat belt. Speed Limits in Italy are implemented rigorously and there are frequent radar traps on the roads. Here is a summary of the standard legal speed limits in Italy for private vehicles without trailers, which may be varied on the road by signs. Be Warned - Speeding and other traffic offences are subject to extremely heavy on-the-spot fines. The best advice here is never drink and drive. If the level of alcohol in the bloodstream is 0.05 per cent or more, you will be facing severe penalties including fines, confiscation of vehicle and up to imprisonment. What is the compulsory car equipment ? Visibility Vest/s - the vests should be carried in the car, and put on before getting out of the car in intercity roads. Crash Helmet is compulsory on a bike or moped. If you car has an overhanging load (e.g. carrying bicycle at rear), you are required to display reflectorised square panel . Otherwise, you might be fined if the sign is not displayed. The use of mobile/cell phones is not allowed when driving in Italy unless you are using a hands-free device. Fines in Italy are issued on the spot. The police can impose the fine and collect 1 quarter of the maximum fine, and must give a receipt for the amount of the fine paid. Make sure that you get an official receipt from the police officer collecting the fine. Note that the fines are particularly heavy for speeding offences. If you park illegally, your car can be clamped or towed away and a fine imposed. You will find available in Italy all grades of unleaded petrol (benzina), diesel (gasolio) and LPG are available as well as lead substitute additive. Petrol service stations are open from 06:30/07:00 to 12:30/13:00 and from 15:00 to 19:30. While on the motorway (Autostrada ), you are guaranteed 24 hours a day service. Credit and debit cards are widely accepted, however it is a good idea to let your card issuer know you will be travelling abroad to avoid your card being blocked. During the day dipped headlights are compulsory when you are driving on motorways, dual carriageways, and on all out of town roads. If you are on a motorcycle, the use of dipped headlights during the day is compulsory on all roads. Rear fog lights may only be used when visibility is less than 50 metres or in case of strong rain or intense snow. Driving in Italy is on the right and you overtake on the left hand side of the road. When overtaking you must always signal in advance with your indicator and keep it on while overtaking. As we mentioned earlier having dipped headlights on is compulsory when driving on the motorway. Credit Cards: Visa, Mastercard, American Express, Diners Club are accepted. Telepass : type of a transponder used by frequent drivers where the toll is deducted directly from the driver's bank account. You will often find that the entrance and exit ramps for the motorways in Italy have quite tight corners, so please be aware of that and drive carefully. One thing to be aware of is that Italian drivers drive much closer to each other than drivers are use to in other countries. Especially when overtaking, they can come right up to your rear bumper. And if there is an opening in front of you, it is expected that you fill it , or someone else will fill it for you. So just be aware of this and do not panic, the best advice here is to slow down and not let anyone rush you. The Italian Auto Club (A.C.I.) offers a nationwide breakdown service number with English speaking operators - call 116 on any phone, twenty-four hours a day. For medical emergencies call 113. For further emergency numbers in Italy , visit our dedicated section. Calls for help on the motorways can be made from the emergency positions, located every 2 km, 24 hours a day. Road conditions : Whether you are driving in Italy, it is always a good idea to keep up to date on the latest road works/accidents, and avoid being stuck in queues. For real-time information including traffic webcams check "Autostrade" website - the company that manages the Italian motorway network. Travel Weather : Check the weather before you leave, in winter make sure you've got snow chains if you are planning on going up into the mountains. 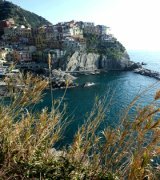 Our Liguria Weather Sectionoffers latest Liguria weather info as well as check out the dedicated sections on Cinque Terre Weather and Portofino Weather . Travel Fun : Do not underestimate the power of travel entertainment when travelling with kids. You will find plenty of suggestions for Travel Games which should keep the little ones amused for a few minutes. 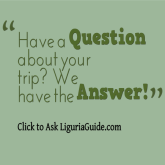 Do You Have a Driving in Italy Tip or Story to Share? Here is your chance to share Driving in Italy tips and personal stories you think might help others have a great driving experience in Liguria and Italy. Did you experience something unexpected you might want to help others avoid? Did something unexpected actually make your trip better? Let us know!